The architect behind some of Edmonton's most iconic buildings, including city hall, has proposed a new project: a mini city made of shipping containers. Gene Dub pitched the idea to the Edmonton Project and is one of 10 finalists for the contest, which aims to build a new attraction in Edmonton. If chosen as the contest winner, Dub said the development — not to be confused with another project that seeks to build a shipping container park at the old Rossdale power plant site— will give purpose to underutilized space in the downtown core. "We didn't really start with the idea of containers," he told CBC's Edmonton AM. "We just started with the problem: What do you with the unsightly parking lots in the Quarters District?" Dub said the container city could set up shop in parking lots in the area of 96th Street and 103rd Avenue. 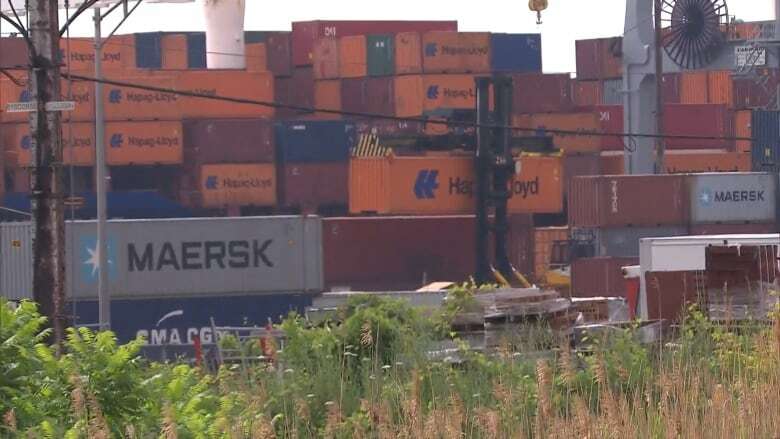 He said the shipping containers would take up about 20 per cent of the space in the lots. "They're used as parking, but they're desolate and unsightly on weekends and nights," he said. "So we thought we would ring the parking lots with these containers in such a way that it screens the parking, but it becomes very interesting and attractive with art." Dub said he envisions the 100 containers that would make up the development as colourful and vibrant additions to the downtown core. With paintings on every container, the area would be transformed into a work of art. Most of the other pitches for the Edmonton Project focus on the river valley. They include river-side saunas, winter pavilions and a food truck Ferris wheel. The winner will be chosen by a panel of judges on March 6. Dub's downtown development would make use of 20 and 40-foot containers, some stacked eight stories high. He said the lots could still be used for parking on weekdays, but he wants to convert the area to a downtown market on weekends. He said vendors could store their tables in the containers. The market would span four blocks, shutting down parts of 96th Street and 103rd Avenue. Just a few blocks away, the 104th street farmers' market would provide competition. But Dub said the location of the popular market will change drastically when the new LRT development is completed. "It's going to have an LRT running down 102nd Avenue," he said. "It's going to cut that market into two and it may be unsafe." So, Dub wants to collaborate. "We have four blocks of open space, and so we'd like to see them move into this other area," he said. "There's still that discussion taking place." Dub said the $1-2 million project is doable, even if it doesn't win the Edmonton Project. "I think it is viable," he said. "And I think, you know, that area will probably not be developed for the next five to 10 years, and it needs something for a five to 10-year period." CBC Radio's Edmonton AM spoke with each of the Edmonton Project finalists over the past two weeks. People can vote for their favourite proposals online.